On the other hand, upgrades are necessary only when you desperately need the new features or modifications, or when the upgrade addresses security issues. In Step 4, the command should be Eject, not Safely Remove. Apparently the menu changed between the pre-release version I used to write the book and the final release. In the book I explain how to disable the History List. Alas, Internet Explorer still keeps "today's" visited pages in the list. So despite all the well-wishing, following the steps in the book does not utterly reset the history list to zero. Don't blame me! That's how Microsoft designed it. Keyboard shortcuts for accented characters exist in Microsoft Office, but not elsewhere in Windows, such as in your email program. You can use the old Alt+Keypad trick to generate those characters, if you can stand how awkward it is. Read more . . .
My observations of how they fool you and help on how to spot various tricks the bad guys use to separate you from your cash and important information. Read more . . .
Yup, I finally got an e-mail message from someone who wanted these instructions. Back in the days of DOS this was a popular pastime. But since the dawn of Windows, I've not written about copying floppy disks...until now! There is an interesting relationship between a monitor's diagonal size and its aspect ratio. Just because you buy a 23-inch monitor doesn't mean you're getting a lot of monitor for your dollar. Optical Character Recognition (OCR) software lets a computer scanner "read" a document and translate it into text inside the computer. Not having room to put this in any book, I crafted a tutorial for this web site. 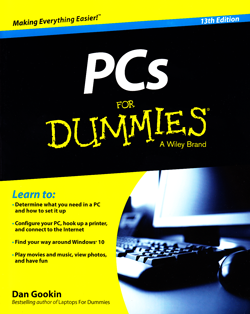 For all blog posts related to the topic of PCs, click here.